Jennifer Mara DeSilva is an Associate Professor of History at Ball State University (Indiana, USA). She has written several articles about the papal Masters of Ceremonies and edited collections examining the reformist behaviour of early modern bishops and the coercive process of sacralizing of space in the premodern world. Her current research focuses on how individuals and groups at the Papal Court established identities through office-holding, rituals, and relationships with groups and sites. Read the full article in the Royal Studies Journal. RSJ Blog: Thank you so much for talking with us! So the canonical age for cardinals was 30, which many people probably find surprising in the premodern era – a lot of undergraduate students don’t necessarily think people in the past lived that long! Why was the age for appointment 30 and does that suggest anything about life expectancy? Jennifer: Calculating life expectancy in the premodern world is problematic. The fact that so many people died as infants or children makes the mortality rate deceptive low. If a man lived past 20 years of age or a woman past successive childbeds, they were likely to live for many years more, barring falling victim to a disease epidemic. With that in mind, we should also remember that there were several canonical ages. The canonical age for becoming a cardinal or a bishop was thirty, which was reaffirmed by the Council of Trent (1545-63). However, the canonical age for other ecclesiastical offices – tonsured monk, deacon, priest – varied over time and according to the authority. Most likely this says more about the vision of man’s intellectual frailty and potential, than it does about how long people lived. Yet, even with these age thresholds articulated, we would be hard pressed to find a medieval or early modern depiction of a cardinal that was not modeled on a much older man. Indeed, many modern films use the same stereotype of bearded maturity, decades past thirty, when depicting the College of Cardinals. This suggests that canonical ages functioned as guidelines illustrating a hierarchy of offices and the need for experience-based wisdom in those office-holders. 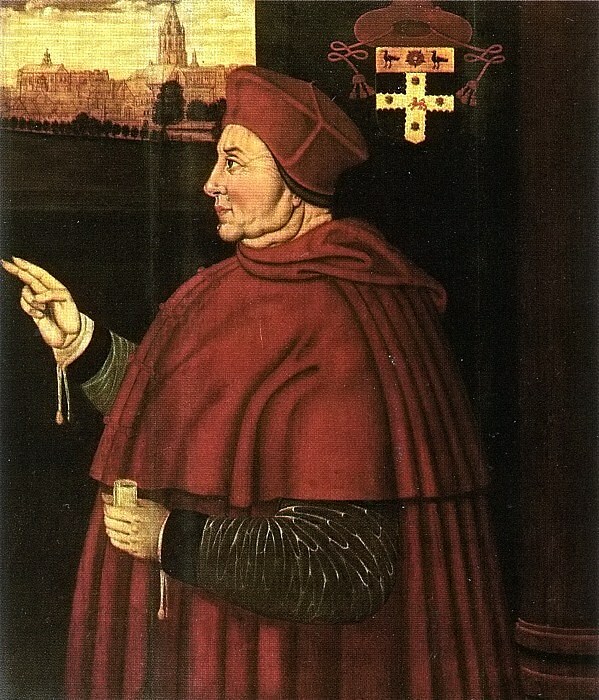 The broad population that the premodern College of Cardinals embraced can be seen in two sixteenth-century portraits: An Unknown Young Cardinal by a follower of Titian (16th century), now at Petworth House, National Trust, UK and Titian’s Cardinal Pietro Bembo (Samuel H. Kress Collection, c.1540), at the National Gallery of Art in Washington, D.C., U.S.A. The unknown young cardinal is likely under the canonical age of thirty, while Pietro Bembo was about seventy when Titian painted his portrait, having been elevated to the College in 1539. RSJ Blog: Your article talks about the life stage adolescentia (14-28 years old). Is this life stage at all similar to that of today’s teenager? Jennifer: Yes and no. In the premodern era, depending on one’s economic status, this phase could include years spent as an apprentice and journeyman worker, as a novice, or at university. By the age of 28 most men were still only approaching the point at which they could afford to start their own household, enter a guild as a master, or hold a civic or ecclesiastical office of power. In that sense adolescentia was a stage of continued dependence or training. This might seem similar to the lengthening period that today many people spend in post-graduate studies or research before landing a first full-time and permanent job in their chosen field. Of course, in contrast to this period’s characterization as “in-training,” financially, intellectually, and emotionally, teenagers today (13-19 years old) face the same stereotypes that Bernardino of Siena and Girolamo Savonarola identified in early modern adolescents. Some things have barely changed. RSJ Blog: How big was the College of Cardinals? One of the reform decrees the article quoted mentioned there shouldn’t be two men from the same mendicant order, which really seems to limit options! Jennifer: Over the course of the fifteenth century the College of Cardinals grew. 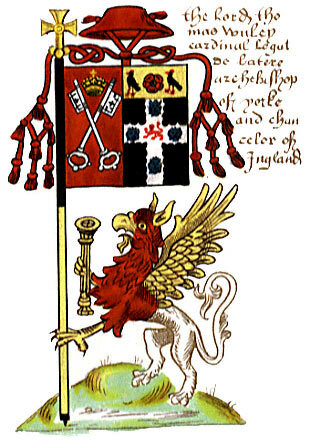 Although reform decrees limited the College to a maximum of twenty-six members, after the 1450s the population fluctuated between the high twenties and the low thirties. Through the 1500s the College continued to grow, reaching a maximal plateau of seventy members. In 1587 Pope Sixtus V reinforced this ceiling by decree and it continued until the late 1950s when Pope John XXIII and his successors allowed it to creep upwards. 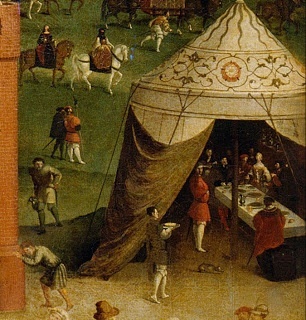 However, even by the late sixteenth century very little store was placed in the fifteenth-century limits, and the mendicant orders played a diminishing role in cardinals’ origins. 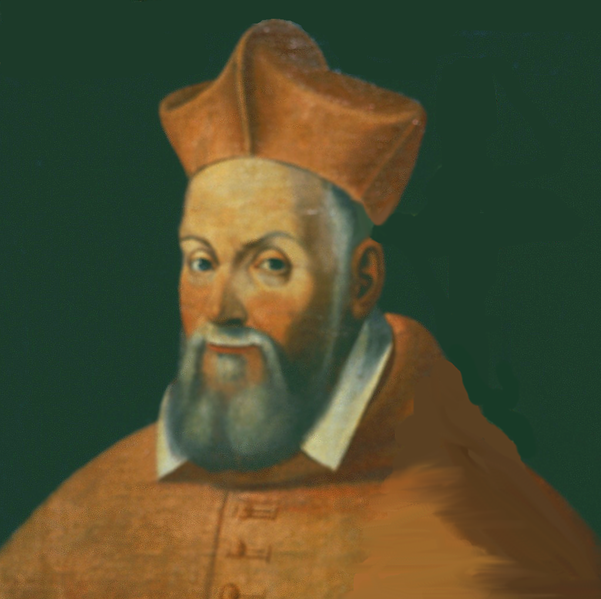 Many men elevated to the cardinalate in the sixteenth and seventeenth centuries were secular canons who had held positions in the pope’s household or in the Curia. RSJ Blog: Your article mentions that the pope is often criticized for these under-aged cardinals but these youngsters are appointed anyway. Who was criticizing the pope for this? Protestants? Or the secular rulers who benefitted? Jennifer: Secular rulers rarely suggested that fewer cardinals be appointed. Through the sixteenth and seventeenth centuries they were more concerned with balancing factions in the College of Cardinals between themselves. This was especially true of France and Spain. Nevertheless, criticism sprung from both Catholics and Protestants, as well as some members of the College of Cardinals. Tension existed between those who had been promoted before thirty years of age and those who sought the promotion of under-aged relatives, against outsiders who had either had no skin in the game (historians of deceased popes) or profited from highlighting continued Catholic abuses (Protestants). RSJ Blog: How much resistance did popes offer to the appointment of under-aged cardinals? Did your research turn up any young cardinal candidates who were never appointed or were made to wait until after they turned 30 for papal appointment? Jennifer: Each promotion occurred because of a distinct assortment of motives and pressures. In the same way that popes objected to adult candidates with unsuitable pasts, there is evidence of reluctance to elevate very young men to the College. In several instances adolescent or pre-adolescent nominees were required to wait several years before their promotion was publicized, during which time they were prohibited from assuming the office’s dress or title. In all cases, these nominees were members of ruling families that were important to the pope. While none of these men were forced to wait until they turned thirty, this practice suggests that there was a widespread acknowledgement that one could undermine the authority inherent in the office, if the nominee was too far from the canonical age. 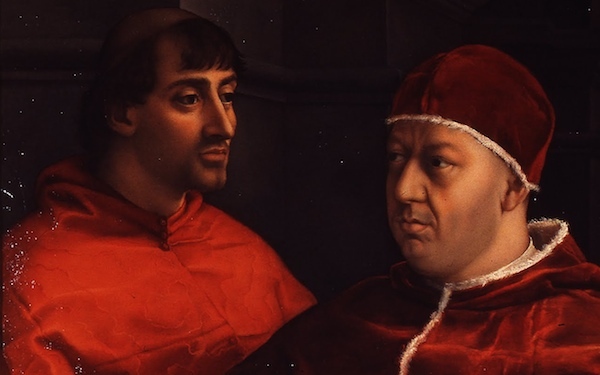 RSJ Blog: Why have historians been so attached to the idea that these under-age cardinals were the relatives of sitting popes rather than elites from Catholic states? Jennifer: Into the twentieth century the papacy stood as an emblem of difference separating Catholicism from other Christian denominations, but also as an emblem of human invention and corruption. While denominational prejudice has largely left the discipline of History, centuries-old criticism that emphasized the pope’s autocratic rule and ability to create cardinals merged with disapproval of the swift social mobility that election to the papacy brought. The result was that papal nephews, sons, and grandsons, many of whom were underage, attracted so much attention and criticism that effectively they obscured the other men who profited in a similar but less conspicuous fashion. The under-aged papal kin provoked a far greater response than under-aged nobles, who traditionally were expected to compete for titles and wealth in a way that was unseemly for the relatives of a cleric. RSJ Blog: Thank you again for you time and participation! What is next for you? Jennifer: You are very welcome, Kristen, Cathleen, and Elena! This year I am one of the inaugural fellows of Ball State University’s Digital Scholarship Lab, where I am using timeline, mapping, and networking software to explore how Bolognese patricians competed for place and power. My current project is a digital study of how patrician families in Bologna, Italy, used offices, both ecclesiastical and lay, to compensate for limited access to executive civic authority. These tools offer exciting new insights and comparative opportunities for studying the past. RSJ Blog: Thanks for doing an interview with us! to begin, how did you get interested in history? especially the period you specialize in? RSJ Blog: Your latest article contribution to the RSNJ is fascinating. Is this a subject you’ve been studying for years? RSJ Blog: What went into the research for this article? RSJ Blog: Was there anything that surprised you when conducting your research? RSJ Blog: Thanks again for letting us interview you! One last question: what are you working on next? RSJ Blog: Thanks for doing an interview with us! to begin, how did you get interested in history? especially the Tudor era? RSJ Blog: Your latest article contribution to the RSJ is fascinating. Is this a subject you’ve been studying for years? RSJ Blog:What are you working on next? Cinzia Recca is a research fellow in Modern History at the University of Catania. Her book “Sentimenti e Politica. Il diario inedito della regina Maria Carolina di Napoli (1781-1785)” regarding the personal diary of Queen Maria Carolina of Naples has just been published in 2014 and will soon be translated into English. Her current research is aimed at a re-writing of the biography of Queen Maria Carolina of Naples through the analysis of unpublished documents. RSJ Blog: Hi Cinzia, thanks for doing this interview! You’ve just published an article in the first issue of the Royal Studies Journal about Maria Carolina of Naples and Marie Antoinette of France. Can you tell us a bit more about it? Cinzia: The historical figures of Marie Antoinette of France and Maria Carolina of Austria have been misunderstood for a very long time. Even after more than two hundred years since Marie Antoinette’s death, some history books still describe her as a silly and superficial woman, who with her fancies, quickened the end of the Ancien Régime and drove the Parisian people to rebel. Notwithstanding this wide spread opinion, Marie Antoinette was a strong and resolute woman, for this reason she still causes animated debates among scholars. The innumerable biographies edited between the nineteenth century and the present day, testify indeed, to a perennial interest in the last Queen of France. While the first Queen has been reconsidered inside the historiographical field, not completely defined yet, the second one hasn’t had a balanced, calm and impartial judgment yet. The interest in Maria Carolina of Naples derives from the necessity to reopen a historiography, which in the past lacked influential interpretations and which needed to be more updated and up to the restored historiographical standards of the Reign of Naples. In fact, during the nineteenth century and part of the twentieth, this regnant Queen’s figure was judged according to two different stereotypes that were to influence the future historiographies of the Queen: the first one, nationalistic ( let’s think, for example, of the opposing interpretations by the “Central European” historians, like Baron Helfert and Earl Corti, the French ones like Gagniere e Bonnefons and the Italian Botta, Cuoco, Colletta, Pepe, Palumbo, Croce, and the more moderate ones by the English Jeafferson and Bearne); the second one, antifeminist, ante litteram, spread everywhere and strongly present in some works by the above mentioned authors. The Empress Maria Theresa said of her that “among my daughters she is the most similar to me”, but about this Queen and this lady, it was necessary to rewrite her history to give the reader a less nationalistic and male chauvinist panorama. RSJ Blog: Could you tell us more about all the Habsburg sisters? Did they all have a close relationship? Or just Maria Carolina and Marie Antoinette? Cinzia: Maria Carolina had a sincere and loving relationship with all her brothers and sisters: Maria Amalia, sweet and charming, was the mature and reassuring older sister who was an example to follow. Even throughout most of their lives as wives they remained on good terms: they used to exchange portraits, letters and gifts. Maria Carolina had also a good, confidential and durable relationship, with the Archduke Leopold whom she considered her favourite brother. Several were the letters that they exchanged after their respective marriages: a correspondence that testifies on the one hand to the confidence of Leopold towards his younger sister about the intelligence and the ability to educate their respective children, on the other hand a solid and long-lasting presence of an older brother to whom to refer in moments of indecision and crisis, both familial and institutional. However, there is a correspondence between Maria Carolina and her brother Emperor Joseph II which testifies to the family ties between the two, confirming the wise Habsburg policy implemented by the Queen who asked for recommendations and opinions on proposals and guidelines that came from the Spanish royal family and British ministers, in order not to make decisions contrary to the interests of Austria. Having been brought up with a sister who was three years younger, Marie Antoinette, almost like a twin, favoured the emotional relationships with the latter. And having shared their childhood, in fact, favored the establishment between the two sisters of a solid loving bond that accompanied them troughout their lives, as is testified by the letters through which they communicated even after they married. So that after the French Revolution and the execution of her sister Marie Antoinette, Queen Maria Carolina swore eternal hatred first for the French revolutionaries, and then for Napoleon. RSJ Blog: In the article you discuss several hate pamphlets against Maria Carolina and Marie Antoinette. Who were the author(s) behind these pamphlets against the two Queens? Cinzia: It depends on the year of publication of the pamphlets. Before and during the Revolution, the majority of the authors of these texts were of course anonymous. Political enemies such as the Duke of Orleans could have sponsored them. 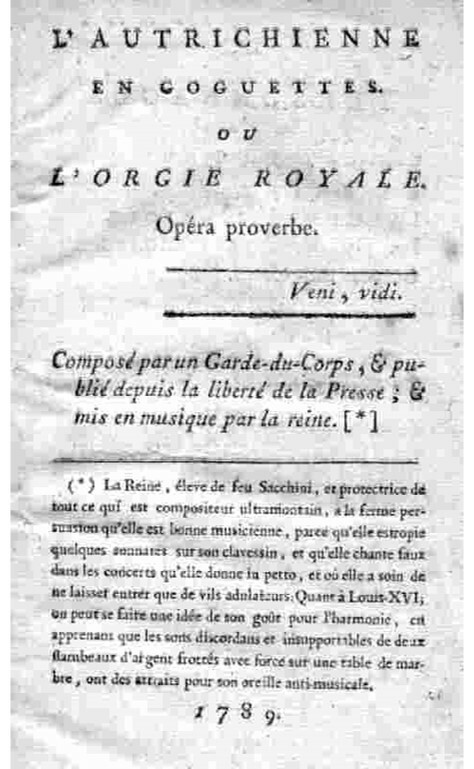 Also booksellers and unscrupulous printers, greedy blackmailers (such as Boissiere who published, Image Des Amours Charlot and Toinette) offered their editions to discredit the King’s Finance. All authors had in common one purpose: to attack the most outrageously, filthy and obscene Monarchy, especially the figure of the Queen considered the cause of the ruin of the country in the interest of Austria. RSJ Blog: Very interesting! Could you also tell us a bit more about the role the Habsburg family and their influence during the time of the French Revolution in Europe? 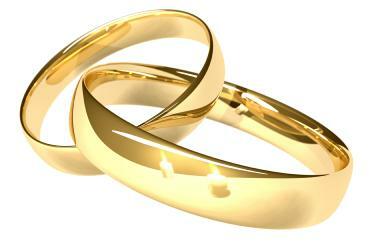 Cinzia: Well it is not easy to answer to this question with few lines, but I will try. The Empress Maria Theresa had extended family power in Europe with her marital diplomacy, the marriages of Maria Carolina and Marie Antoinette are two examples. So after the death of their beloved mother, the Habsburg had inherited a position of power even leadership in Europe, which was becoming increasingly difficult to maintain. The French Revolution of 1789 represented a mortal danger for them, during this period they were more worried than the most European dynasties by the need to defend their extensive territories. Therefore in the years immediately after the French Revolution and also after, during the Napoleonic period, the Habsburg were involved in a series of wars against their old enemy, France, that lasted almost a quarter of a century and finished with the Treaties of Vienna in 1815. RSJ Blog: Quite a time of change! Is there anything new you are working on that you would like to share? Cinzia: I have to confess to you that it is a quite busy time for me. I recently finished translating into English and up dating my book regarding the personal diary of Queen Maria Carolina which, I hope will soon be published. I am starting a monograph regarding the Habsburg shadow in the Kingdom of Naples, analysing and focusing the attention on the precious suggestions contained in un-published letters that Emperor Joseph II and Grand Duke Peter Leopold sent to their sister during the pre-French-revolutionary age. And in the meantime, I am starting to investigate the crucial role that ‘the Winspeares’ a noble family and native of the county of Scarborough had acquired in the Kingdom of Naples during the Eighteenth century. RSJ Blog: And finally, will we see you this summer at the Kings & Queens IV conference in Lisbon? If so, what will you be presenting? Cinzia: Yes, I will be very happy to join you at the next Kings & Queens conference in Lisbon, when I read a paper entitled ‘The reversal of dynasties’ during the era of the House of Bourbon in the Kingdom of Naples regarding the history of the Neapolitan branch of the Bourbons showing how the balance of power and alliances changed within the House before and after the arrival of Maria Carolina of Habsburg –Lorraine. RSJ Blog: Thank you again, and see you in Lisbon! RSJ Blog: Hi Nadia, thanks for doing this interview! First, your article presents us with results from an experiment in the classroom with a Tudor play. Could you tell us a bit more about this? RSJ Blog: Great! Now, you’re bridging the gap between gymnasium and university with this project – where is your focus? Is it more about bringing new pedagogy to the classroom? or about doing research on classroom dynamics for the university? RSJ Blog: That sounds great. Could you recommend anything for teachers – be it at the university or the gymnasium for recreating this experience? RSJ Blog: Thanks so much for your time! and good luck with your research. Carole Levin is the Willa Cather Professor of History and Director of the Medieval and Renaissance Studies Program at the University of Nebraska as well as author of this article in the inaugural issue of our journal. She specializes in early modern English women’s and cultural history and has written extensively on the English Renaissance and Elizabethan England. At the moment she is a Fulbright Scholar at the University of York, UK. We asked her to tell us a bit about the article and her current work. RSJ Blog: Hi Carole! Thanks for doing this interview. First, please tell us a little more about the Elizabethan ghost story? It sounds fascinating. Carole: In my essay, “Elizabeth’s Ghost,” that I am so honored was in the premiere issue of the Royal Studies Journal, I ended with a kind of ghost story about Queen Elizabeth that ironically was when she was still alive but on her deathbed. A lady-in-waiting, Elizabeth Guilford, who was sitting with her, decided to get up and take a break, given the queen was asleep, and walked into some other rooms. She was shocked to see Elizabeth walking in the room ahead of her but when she went on the queen vanished, and when she returned to Elizabeth’s chamber, the queen was still in bed. But I had another ghost story about Elizabeth I did not use in the essay, as its source was later than the Stuart Age, the topic of my essay. A few centuries after Elizabeth’s death a Spanish monk wrote that after she died her ghost would wander about London, shrieking, “The sovereignty of the kingdom was for forty years, but hell is forever.” Either as a ghost Elizabeth forgot how long her reign was – or the monk did not have the correct information. RSJ Blog: Spooky! Besides appearing as a ghost, how does a dead queen, such as Elizabeth I, influence politics long after her time on the throne? Also, seeing that you’re an expert on Elizabethan England, yet your article deals mostly with Stuart England, were there any particular difficulties you encountered? Carole: I love this question, as it goes to the heart of the work I’m now doing. But I am also very interested in how her image was used in the century after her death to make contemporary political points about Protestantism and nationalism. And yes, before now my work has centered on Elizabethan England so in this new research project I am learning so much about the Stuart period. It is fascinating but a lot of work! The article is part of a larger project on how the representations of earlier queens such as Elizabeth – but others as well – were used in the Stuart Age. 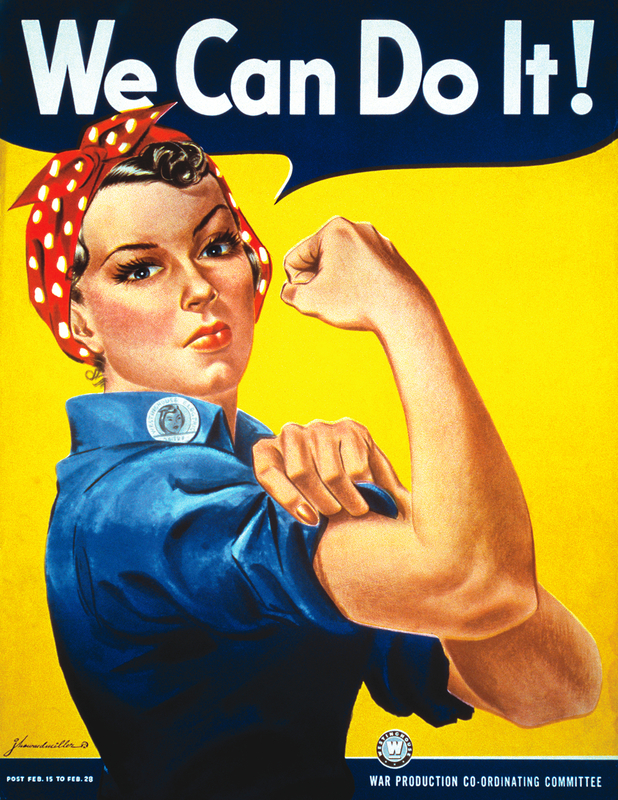 RSJ Blog:So, all about empowering women! Right on this topic: you are also an editor for the book series Queenship and Power (Palgrave Macmillian), could you please tell us more about it? This series focuses on works specializing in gender analysis, women’s studies, literary interpretation, and cultural, political, constitutional, and diplomatic history. It aims to broaden our understanding of the strategies that queens – both consorts and regnants, as well as female regents – pursued in order to wield political power within the structures of male-dominant societies. We already have over twenty-five books in the series, and they are all first-rate. RSJ Blog: Back to your article and Queen Elizabeth: Why do you find studying Elizabethan England so fascinating? Carole: I have to confess that I do find Elizabethan England endlessly fascinating, and I have for many years and expect to for the rest of my life. Elizabeth herself is such a multi-faceted person and there is so much in this time period that is both strange and different and yet resonates strongly with today. That really came home to me when I did the book Dreaming the English Renaissance (Palgrave Macmillan 2008), and saw some dreams that are so universals while some ways dreams understood so different from today. RSJ Blog: Multi-facetedness is sure an argument, but what other epoch would you like to explore when you want to take a vacation from early modern England? 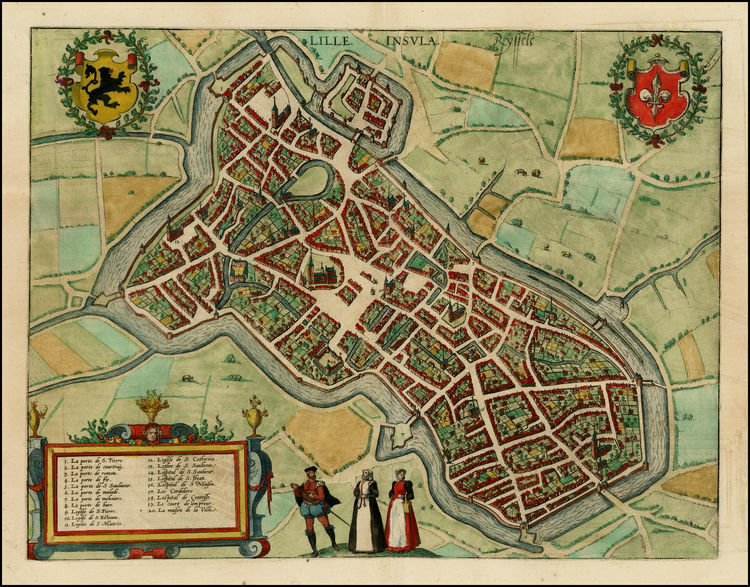 Carole: There is still so much to explore in sixteenth and seventeenth-century England, but there are aspects of medieval history that are fascinating to me as well. RSJ Blog: We are coming to the end of this interview – so we would like to hear about what you are working on right now? Carole: My new book project is called Boadicea’s Daughters: Representations of British Queens in Early Modern Nationalist and Religious Discourse and Fantasy. I am looking at how the first century Celtic queen who fought the Romans was rediscovered in the Tudor period, and comparisons made between her and Queen Elizabeth’s in Elizabeth’s reign, and how both they, Anne Boleyn, and Mary I were represented during the Stuart age. I’m fascinated in the ways these queens are used to promote Protestantism and the rule of queens. RSJ Blog: Finally, will we see you at the next Kings & Queens Conference in Lisbon? Carole: Alas, I will not be able to attend the next Kings and Queens Conference, which is a shame as the two I have attended are among the best conferences I’ve experienced in terms of fine papers, mutually valuable conversations, and a strong sense of community. I definitely am planning to attend this conference in future years. RSJ Blog: Then we are looking forward to seeing you there!